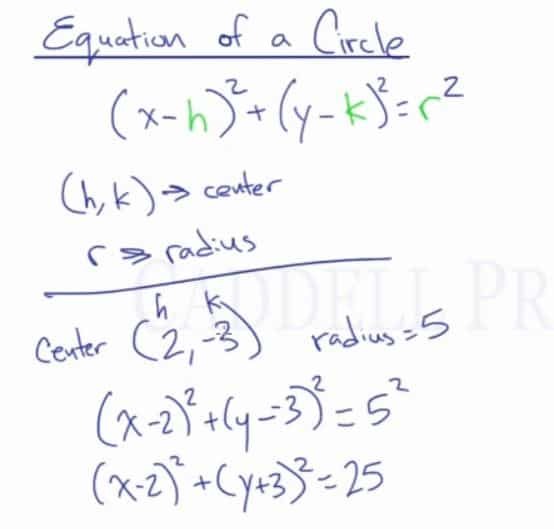 In this video lesson, you will learn the equation of a circle and how to identify the center of the circle and its radius if given the equation or a circle. where (h,k) is the coordinate point for the center of the circle and r is the radius. Since we know that the x-value inside the parenthesis is always the reverse operation of the coordinate point, the center would be . The radius is always the square root of the value on the other side. where are the coordinates for the center of the circle and is the radius. For example, if the center of a circle is and the radius is . The last part is always the radius squared. Something to notice is that whatever signs and have, it’s going to be the opposite of what’s in the formula. The center of the circle is . The signs are opposite on what is in the formula. The radius is because . So, the center is . Keep in mind that whatever sign you have in the formula is the opposite sign for the center of the circle. And the last part is always radius squared. So, the radius is the square root of the last number.